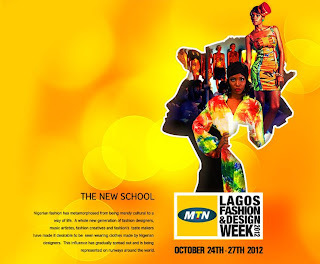 Lagos — The MTN Lagos Fashion and Design Week (MTN LFDW) will be held in Lagos on the 24th-27th October 2013 and will feature some 33 Nigerian designers as well as luxury British designer Matthew Williamson, who will headline the event as the International guest fashion designer. The show taking place at the Eko Convention Centre of the Eko Hotel, Lagos, will kick off with the Serengeti Exhibition which will be open to the public from the 25th of October. The Serengeti Exhibition presents a perfect opportunity for fashion and design related community to present their work to the general public and provide an opportunity for the creatives to engage with the guest at the exhibition and provide them with some insight to their work. The designers participating in this year, runway shows are: Ituen Basi, Iamisigo, Kelechi Odu, Jess Stefanie, Marayah Oh, Xclamations, Eki Orleans, Sunny Rose , Bridget Awosika, Iconic Invanity, Tiffany Amber, Odio Mimonet, Alali Boutique, Ozora by Zee, Viv La Resistance, Vintage Colette, Grey ,Omer Asim, Alter Ego, Jewel by Lisa, Lanre Da Silva Ajayi, Akpos Okudu, Xclamations, House of Form and Function, Ejiro Amos Tafiri & Beatrice Black, Ibitein, Kinabuti, Kiki Kamanu, Kola Kuddus House of Marie, Obsidian, Koketso Chiepe, Republic of Foreigner , Anita Quansah, Mango and Mai Atafo. This year there will also be a presentation of the youngest and brightest fashion talent emerging from Nigeria called the LFDW Young Designer of The Year. The LFDW Young Talent has been selected as the next generation of Nigerian fashion. This year, luxury British brand Matthew Williamson will be presenting the final show to close the event. Matthew Williamson is synonymous for its luxurious collections which incorporate bright and exotic colours. Founded in February 1997 by designer, Matthew Williamson and CEO, Joseph Velosa the brand will celebrate its 15th anniversary this Spring/Summer. Commenting on MTN LFDW, Matthew Williamson said, "As fashion designers, we always seek new inspirations, opportunities and frontiers. Visiting Lagos for the first time and indeed Nigeria will provide me a chance to do this and contribute in helping to build the fashion industry in a challenging but innovative new market." He further added that Lagos was one of the many stops he and his partner Joseph Velosa will make this year to new emerging markets. Omoyemi Akerele the founder and Creative Director of MTN Lagos Fashion and Design Week said, "Our vision is to have a guest international designer each year as part of our vision to place Lagos on the map as a fashion capital; having guests like Matthew Williamson for our finale means we can achieve this."